In a better world, the policies of influential nations in areas of trade, national security, human rights, and international migration would reinforce one another and promote a wealthier and more just global system. However, the sad fact is that powerful nations generally pursue trade and national security policies that all-too-frequently lead to negative outcomes for the human rights of undocumented migrants, those displaced by conflict in other countries, and immigrants. This book examines these issues from the perspective of U.S. policy in the post 9-11 era. The book is an edited collection of 12 papers in the form of chapters organized into four sections (Political Economy; Historical Perspectives; Policing the Borders; and Beyond U.S. Borders) along with integrative introductory and concluding sections by the editor, and a pithy Afterword by an additional author. The authors are scholars and researchers in anthropology, law, social work, and sociology. The core of the book is formed by ethnographic accounts of the human rights impacts of U.S. economic, security immigration, and drug-control policies. Seven of the 13 contributions (namely the 12 chapters and the Afterword) are illuminating ethnographic accounts. They document human rights policies, practices and outcomes in the administration of “port of entry” controls on Mexicans crossing into the United States (Chapter 2), the impact of 9-11 security measures on Arab and Muslim immigrants (Chapter 6), the policing of migrants and ethnic minorities in Idaho (Chapter 7), the process of deporting Mexicans (Chapter 8), “trafficked” women from the former Soviet Union (Chapter 9), the impact of Plan Colombia on forced displacement (Chapter 11), and the role of international NGOs in addressing the rights of individuals displaced by war in Iraq (Chapter 12). The six other chapters provide literature reviews, discourse analyses and informed commentaries that cast light on particular topics and wider themes. These chapters include: a review of the literature on international migration and globalization, with attention to implications for U.S. policy (Chapter 1), a discourse analysis of how mainstream American magazines view the threats of large ethno-linguistic minorities, particularly Mexican Americans (Chapter 4), a review of previous studies and selected examples from popular culture and statements by politicians which “demonized” Arab and Muslim Americans in the post 9-11 period (Chapter 5), a summary of Chinese and U.S. official views of the terrorist threat constituted by Uighur and Tibetans in exile (Chapter 10), and an informed commentary on the impact of U.S. trade policies on international migration pressures, the origin of anti-immigrant sentiment in the United States, and policy options for protecting migrant workers (the Afterword). In sum the book is a collection of papers covering selected policy topics across a wide range of human-rights related issues. The introduction and conclusions by the editor serve to clarify the objectives of the book and to draw attention to overall conceptual and policy conclusions. The book’s first stated objective is to “highlight the threats to migrants’ rights and safety that flow from U.S. polices relating to immigration control, international trade, drug-trafficking suppression, and national security” (Introduction, p. 3). The volume is largely successful in achieving this goal. As noted above, three of these topics--immigration control, the suppression of drug trafficking, and policing related to national security--are addressed in ethnographic and other accounts that clearly emphasize the risks of negative human-rights outcomes. International trade, in contrast, is treated more unevenly. The book contains no ethnographic accounts of trade impacts. “Free trade” patterns are addressed uncritically as a key force behind migrant motivation in the review of international migration (Chapter 1), and mentioned, but not analyzed, as one of the important sources of forced population displacement in Colombia (Chapter 11). Fortunately, the Afterword chapter gives comments on how new trade patterns have led to widespread job and income loss among small farmers in less-developed nations, particularly Mexico. The Afterword also comments on the failed efforts to include better protection and new options for small farmers and others affected this way. The editor addresses question of new options in his conclusions, noting that reforming U.S. immigration policy through a human and migrant rights approach could usefully involve “permitting freer immigration”—an approach that could only be supported if Americans affected negatively by higher immigration were compensated. A second objective is to “bring the state back into theorizing” with respect to the wide range of policies that need to be considered in “a comprehensive immigration reform” (p. 5). The book attempts to do this in part by covering many policy fields: economic, security, drug-enforcement, human rights, and border controls as they relate to international migration. Integrating across these themes in the concluding section, the editor offers several suggestions for elements of a comprehensive reform. These include some relatively conventional ideas, such as promoting improved U.S. policies to “mitigate poverty and expand economic alternatives abroad” (Conclusions, p. 250). They also include more controversial proposals, such as making the political case that improving “workers’ and migrants’ rights is good for immigrants and for U.S. citizens equally” (p. 149). Also controversial is the proposal to abandon “ineffective” military force in dealing with illicit trade. The list could be longer. It does not examine other measures, such as ending the U.S. prohibition on marijuana use, even through this measure meets with significant public approval in several U.S. states. Similarly, the book does not address the need for new controls to protect or compensate rural peoples in less developed nations who are faced with forced displacement arising from violence associated with new investments in mining and the speculative acquisition of forests and agricultural lands. The third and final objective of the book is to “take discussion beyond the level of whole states and national populations” (p. 5) by addressing the role of international institutions in promoting a wealthy and more just world. In this effort, the book opens the door but leaves much to be explored. It touches upon U.S. influence on the policies and programs of global international institutions, such as those on trade and investment promoted by the International Monetary Fund and the World Bank, and those on human rights policies by specialized United Nations agencies. 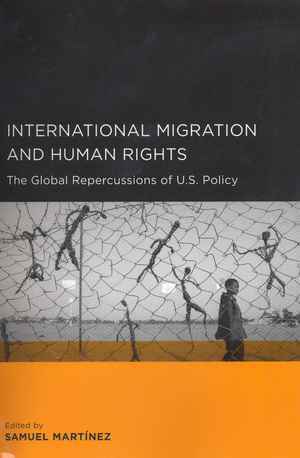 These policies--which are beyond the level of individual states-- are examined briefly in a few places in the paper on global migration, the editor’s conclusion, and the Afterword. By signaling the importance of the topic, the book provides encouragement to others working on it. The book is an excellent source for senior undergraduate and graduate courses. It also provides a strong base and encouragement for new research to document the human rights consequences of U.S. policies in areas not covered in the present volume—such as those related to foreign corporate investments in large scale production of commodity exports. It implicitly invites studies comparing U.S. policies and human rights impacts with those of other regions and nations, such as Europe, Australia and Canada. I recommend this book for all those concerned with improving the human-rights outcomes of trade, security, illicit drug control, and migration policies of wealthy nations. Alan Simmons: Rezension zu: Martínez, Samuel (Hrsg. ): International Migration and Human Rights. The Global Repercussions of U.S. Policy. Berkeley 2009 , in: Connections. A Journal for Historians and Area Specialists, 08.06.2012, <www.connections.clio-online.net/publicationreview/id/rezbuecher-12586>.